Buy blue pink water bottle covers from our online shopping portal and never get embarrassed by your old water bottles. These are blue in color which are printed will colorful phrases that reflect a stylish and superb feeling around the room or office. These bottle covers are blue in colors and are printed in pink. Our covers have vibrant designs which look fascinating when you place it over the bottle. These bottle covers are opaque and have high tearing strength as these are made with superior grade casement cotton. This kind of fabric does not allow light to pass through it therefore prevents any chance of bacterial growth in the water. It also blocks off the heat and keep the water cool than the surrounding area. You can use these anywhere you see a water dispenser. You can use this in offices, restaurants and houses to cover the dirty bottles. It gives a good impression without leaving any trace of the old bottle. 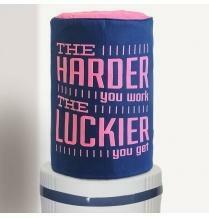 Buy Blue Pink Water Bottle Covers from our online shopping portal and pour the water in style. After covering these bottles, you will notice a big difference in your water dispenser and its surroundings. It will spread is vivid appearance across the room. It is very easy to put on and remove. You can even clean these with a through machine wash. Even though you will never notice any decrease in color or texture of these Water Dispenser Bottle Covers. These are available in free sizes especially for 20 liter bottles. You can also customize these by filling up your requirement details in the form in our website. Create a healthy living environment by buying Blue Pink Water Bottle Covers from our online shopping portal . You can browse through our website for various colors and select your right choices. We also offer cash on delivery services for all our customers. You also get 100% buy back if the product is not up the mark. Further, you can return these products during any condition within 30 days of purchase.